We build the best quality custom golf cart seats that money can buy. We have industry leading experience that spans over more than 30 years - the result is that not only do we put out custom golf carts seats that have been fine tuned down to the most minute detail, we're also on the cutting edge with respect to new, interesting, and innovative designs. 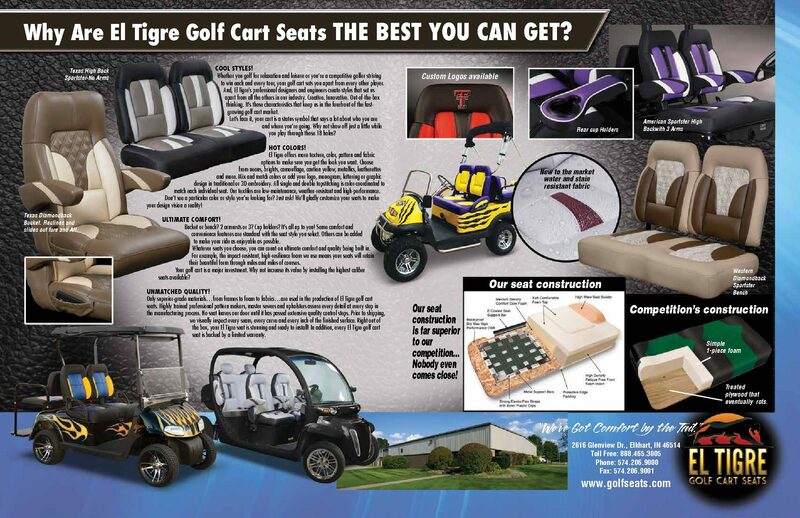 We at El Tigre believe you can have everything when it comes to custom seats for your golf cart. Our Elkhart, Indiana based company has designed a new line of golf cart seating that is not only attractive with high style, but offers exceptional comfort and durability. Our design and engineering team is committed to creating new and innovative products to keep up with the fast pace of this growing golf cart industry! Feel free to contact us about your custom seat design ideas. After all you deserve the seat you want. El Tigre Golf Seats offers more than just beautifully designed seats. We also sell seat covers and accessories. Remember no golf cart is complete without a custom luxury golf car seat by El Tigre Golf Seats. Don't see a particular color or style that you're looking for? Just ask! Golf is meant to be a game about leisure, relaxation, and skill. When you need custom golf cart seats to play through your eighteen holes with impressive fashion, you need to be sure that the golf carts seats that you buy are of the highest quality to ensure that they will last for many tours to come. You’ve already invested enough money making sure that your golf cart will take you from hole to hole without issue, why not go the extra mile to buy the highest caliber golf cart seats on the market? With GolfSeats.com, not only are you ensured the highest attention to detail possible for your custom golf cart seats, you’re also guaranteed a level of material quality unlike any other. Our seat designs are what separate us from the pack, and making your golf cart the sleekest on and off the course is our specialty. Whether you’re looking for bucket golf cart seats, or something similar that will give your golf cart that extra-special touch of elegance, we at GolfSeats.com have you completely covered. Take some time to browse around our site and choose a set of golf cart seats that will have you riding through the course in style. If you’re seeking custom golf cart seats that will suit the majestic golf courses in The Villages, FL or any of the other acclaimed courses or golf cart friendly communities around the world, then look no further. GolfSeats.com can provide you with the comfortable and stylish seats that you’ve been looking for. We are a key supplier of golf cart seats in The Villages, FL. one of the largest golf cart friendly communities in the U.S. Our growth is a direct reflection of a quality product along with the relationships developed with our customers. View this flyer in a larger format by going to our page "The El Tigre Difference". Click the image to view!